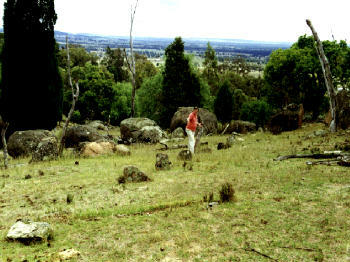 The NSW Central West contains a host of megalithic stone arrangement sites, some being the earliest built on Earth. Many more surely await discovery, probably overlooked because of their badly weathered condition. This is the case with a number of sites just west of the Blue Mountains. 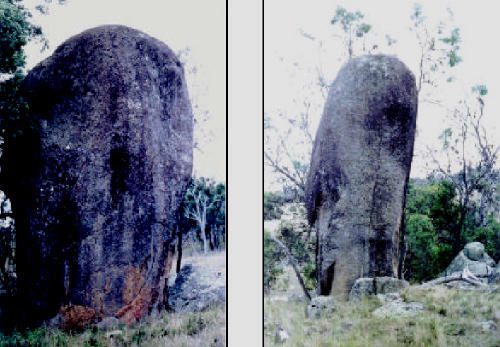 During 1969 I came across a large granite pillar-like menhir, a standing stone 4.6m in height by 4m in circumference, erected upon a hillside overlooking the Fish River south of Lithgow. Upon one side I detected a number of very faded engraved symbols too indistinct to be identified. Over the next few years I would find a number of widely-scattered crude stone circles and other ancient structures weathering on nearby hillsides. Photo © Rex Gilroy 2004. Then in August 1974 a Bathurst district family informed Heather and I of a lengthy stone alignment on their granite-covered farming property. Excited at the immense importance of these stones, we commenced an investigation there that would confirm my theory, that Australia was the birthplace of a highly-advanced stone-age civilisation. The stones extended in a line from south to north, measuring from as little at 60cm to one or two metres apart for up to 2km, weighing an average 120lbs [although some were much heavier]. We found that measurements for the varying distances between each stone were repeated at intervals throughout the alignment, suggesting there had been a mathematical purpose behind their placing. We later examined a second alignment 4km to the east reported to us by another farmer. Subsequent measuring showed it to be the same length, on a north-south axis, the measurements between each stone producing much the same results as before. The Gods of Old Uru do not give up their secrets willingly. For the next twenty-five years I would labour on to solve the mystery behind the mathematical placing of these stones. Yet, as often happens the answer was always staring me in the face. On Sunday 19th December 1999 I made a profound discovery while examining the figures from the alignments, a discovery that has now solved the mystery behind a great majority of Australian megalithic stone arrangements, if not elsewhere across the earth wherever the Uru erected their timeless monuments to the heavens. Rex Gilroy pointing to where the smaller stones pass through the alignment of bouders aligned on an north-east/south-west axis. For, it is now certain that each stone at the two main Bathurst alignments had a singular purpose, as markers of the seasonal risings and settings of the major and lesser known stars and planets upon which Uruan agriculture depended. This discovery reveals the purpose behind just about every major megalithic formation in the Bathurst region, and confirms my theory concerning the main purpose of the “Gate of the Moon”. As early as 1978 I realised the Milky Way revolved upon the central axis of the two main alignments, and that deep notches were carved atop certain stones in the western-most of the two alignments through which certain stars could be aligned north or south. Yet all these problems were still ahead of us when Heather and I made our first visit to the farm containing the first alignment which turned out to be a miserably cold day. I shall never forget that scene, in a grass- covered field in pouring rain, as we stood before a row of crudely shaped granite rocks stretching into the distance. After our hosts had conducted us along the full length of the alignment we gave in to the freezing conditions and left, soaked but excited. Within a fortnight we were back in slightly better weather, equipped with cameras, pens, writing pads and tape measures, to commence an investigation that would lead us to even greater discoveries in the years ahead. The stone of this first alignment [as with the second] extended in a line 40 to 60cm above ground, from south to north one behind the other at varying distances apart. I soon found from measurements that the distances between each stone repeated themselves at intervals, and I suspected then that there was a mathematical purpose behind their placings. At about the halfway point the stones pass through a gap between two huge boulders, themselves one end of an alignment of eight massive stones erected on an north-east south-west axis. It was later found that the south-west end boulder was in alignment with a great boulder atop a nearby rise to the east and a 30m tall pyramid-shaped hill on its western side. Near the eastern base of this hill I found a dolmen. Later dowsing of the site showed the 2km alignment followed a subterranean watercourse. We also later found this to be the case with the second 2km alignment, whose northern end stops short of a pyramid-like granite hill of about 30m height. At its northern end the first [western] 2km alignment stops in an open field. About the half-way point of the second [eastern] major alignment, there is another, composed of much larger granite stones, over a dozen, aligned upon an east-west axis for about 100m and which stops a few metres from the main alignment. I discovered this small alignment during another inspection of the structures in early June 1980. In the course of my investigation I was caught in a sudden cold change of weather, the area soon enveloped in wet mist. I chanced to spot this hitherto unnoticed lengthy row of waist high to taller stones extending east from the 2km alignment among trees and shrubbery and made an inspection. At a point close to the western end of this alignment, I chanced to step between the narrow gap of two large stones, and with my camera bag, and a larger one containing all my usual equipment slung over my shoulder, happened to place a hand on each of the stones. As I did so, I received a mild electric shock that sent me flying to the ground. Suddenly ‘zapped’ of energy, I felt exhausted for quite some time thereafter and was unable to continue my investigations for the remainder of that day. I later learnt that megalithic stone alignments have been found to be conductors of natural electricity worldwide. Heather and I had not long confirmed the name of the Australian megalithic civilisation as ‘Uru’, and now we were asking ourselves how these people were able to trap and harness natural earth electricity, and for what purposes? 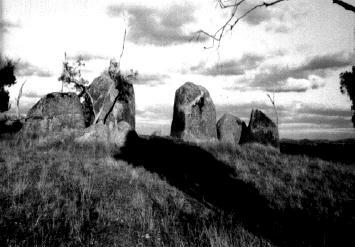 The majority of Australian megalithic stone alignments, circles and other arrangements are composed of either granite or diorite, the later also a known conductor of natural electricity. Sometimes a stone arrangement is found composed of either of these ‘positive’ stones and some other ‘negative’ [ie non-electricity-conducting] stones. At the southern end of the first 2km alignment in September 1974, I found a 9m by 9m stone [granite] circle of ten large stones erected upon a granite base of the same dimensions. I found one of the stones to be an oblong-shaped flattish altar. It was then I also noticed the 1.8m tall stone on its left was something far more startling - a crudely carved weathered human head. The head, male-looking, was remarkable, with a high forehead and eyes, nose and mouth carved toward the base. It faced the east, where 15 metres away, I noticed another upright granite stone, another human head of the same height. Facing the male head, it too displayed a high forehead, with eyes, nose and mouth toward the base. Whereas the other [male] head had a ‘bald’ appearance, this one showed the weathered remains of wavy hair. Its overall appearance looked female. I speculated that here were representations of the Sky-Father and Earth-Mother, principal deities of the old megalithic cultures [the names of Nim the Sun-God and Nif the Earth-Mother Goddess were years in the future - the true identities of these heads], or even perhaps “ancestor stones”. Nearby the previously mentioned stone circle, I also noticed three large stones separated a few metres apart one behind the other in a northwesterly direction. On another visit Heather and I followed the direction marked out by these stones. 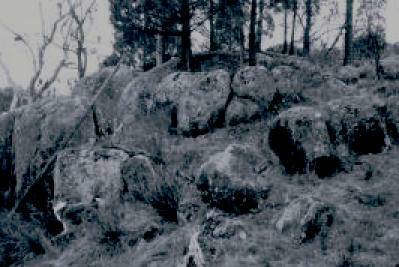 Several hundred metres ahead, upon a hilltop, we reached a pile of granite rubble, the remains of a collapsed structure. Continuing on a few hundred metres more we came upon three great granite boulders standing upon base rocks. A natural enough sight in the hills hereabouts we thought; that is until we discovered that each had been placed 18 metres apart forming a perfect triangle! We soon returned for yet another investigation within a few weeks, to make yet another important find a few hundred metres to the east of the triangle, upon a hillside; a 5m tall by 10m in circumference menhir, erected upon a base of carved granite blocks partly covered in soil. Excavating the soil from the southern end of the platform, we discovered it to be composed of three blocks at that side. The largest of these measured 2.4m long by 1.2m wide by 90cm thick; the other two each being 1.2m in length, width and height. In the vicinity of the north-west alignment of structures we found, erected upon a north-south axis for about 10m, another remarkable, though short alignment. Towering about 4.5m above the smaller stones spaced a couple of metres apart on its south, and a third on its north side, was a massive granite phallic-shaped stone. Measuring 6m tall by 4.5m circumference, from another angle the megalith gave the appearance of a human face in profile gazing west. Yet one more puzzle was discovered upon the nearby hillside near the platformed menhir - a large granite rock, into which had been cut a libation bowl 90cm deep by 60cm long and 30cm wide. But how? The granite in this district blunts any modern engineer’s drill! Surely no stone artifact could have done the job - and we certainly have yet to learn how these ancient stonemasons carved the other artworks hereabouts. To date, not one stone adze of any kind has been found anywhere in the entire region covered by this mighty observatory. The later electric shock I was to experience near the second 2km stone alignment led me throughout the 1980’s to research deeper into the conducting of natural electric currents at megalithic stone arrangement sites worldwide. Recalling that the northern end of the second 2km alignment stops at the base of a pyramid-shaped hill, and that the first alignment stops at its southern end at a stone circle, I wondered what purpose, if any, these features had in the trapping and channelling of this natural energy. In the years ahead, as the number of megalithic sites hereabouts grew, the “Bathurst Stonehenge” was found to cover an area of some 20 square kilometres, it would also be discovered that natural electricity was being channelled throughout the whole of these sites in modern times, just as it has since this mighty earth-energy centre was established by the Uru 10,000 or more years ago. The full purpose of this great astronomical centre may never be known, for the answers have long ago vanished with the builders of these “Australantean” monuments. This two-terraced platform structure, used for ceremonial purposes, was erected upon the four cardinal points of the compass. Its rocks have been worn down with great age. It stands near the half-way point of the first alignment.